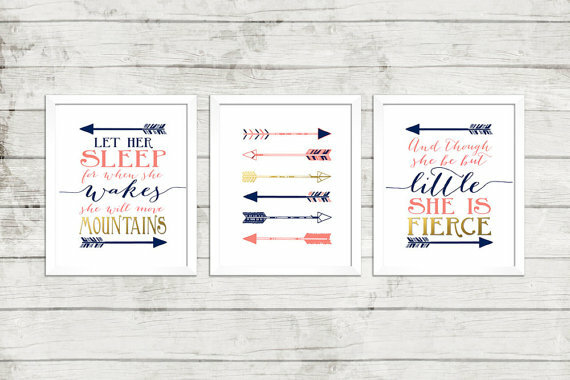 Bard on the Blogs: Shakespeare Inspired Gifts! Welcome! Happy birthday to Mr. William Shakespeare TODAY!! He would be 451! Crazy how time flies, am I right?! Today I am chatting about buying ALL OF THE THINGS for that special Shakespeare lover in your life!! (*sends entire list to loved ones) Let’s see what we have here! As something a little extra (because we love you guys) Alexa and I are hosting a giveaway for the duration of Bard on the Blogs!! 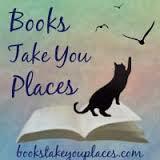 You just head on over to the Rafflecopter and see what’s up! 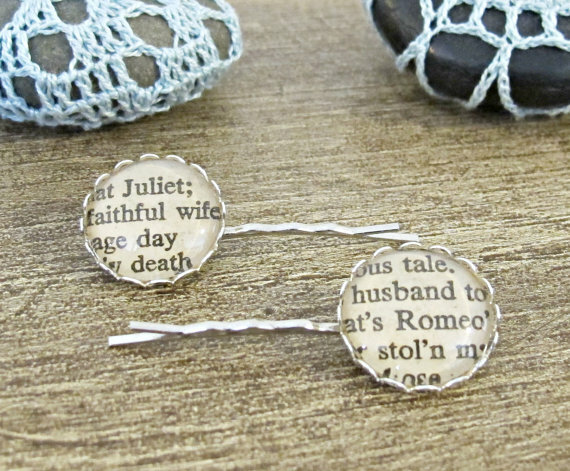 Romeo and Juliet Hairpins! Admittedly not my favorite play by Shakespeare (read: my least favorite, possibly) but these are still pretty neat! I wouldn’t say no to receiving these babies! Find them here. 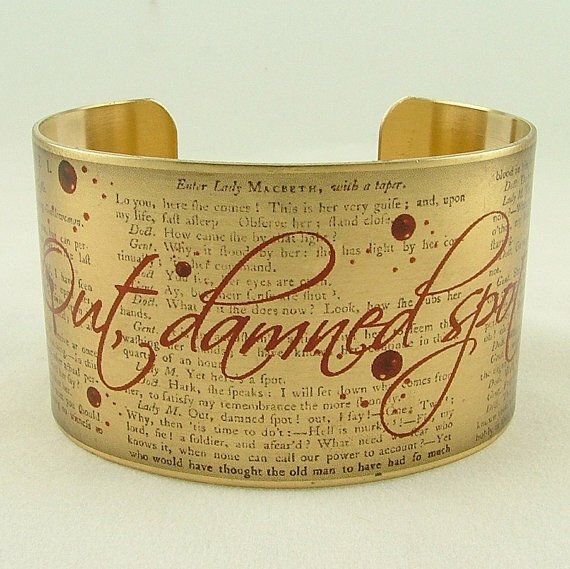 Look at this Macbeth cuff! There are tons of other designs, but I LOVE how this one captures the dramatic and macabre moment when Lady Macbeth struggles to clean the blood from her hands. Find this cuff (and others like it) here. 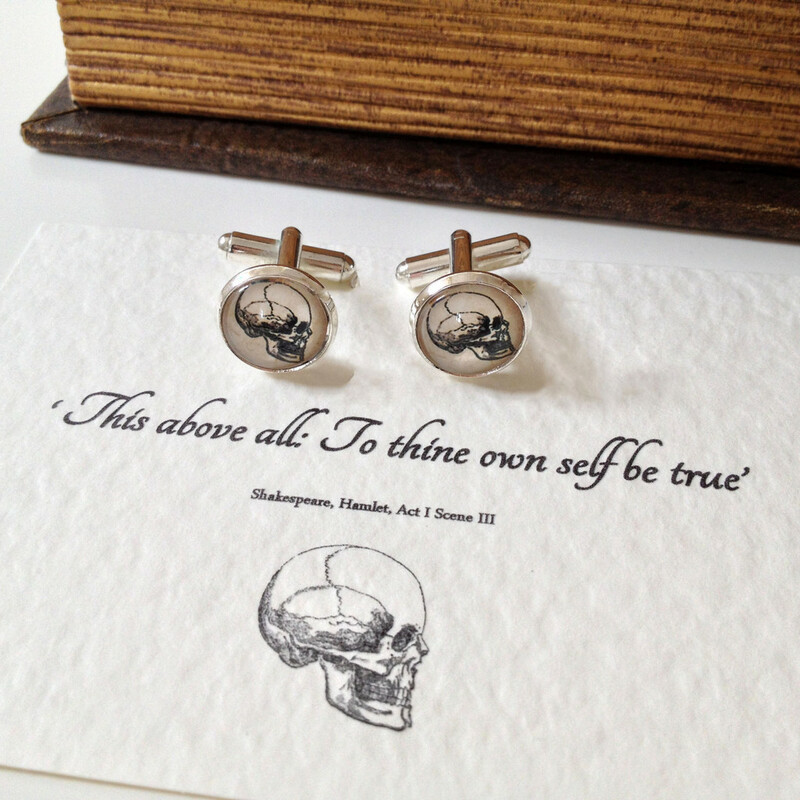 These Shakespeare Hamlet Skull Cufflinks will go perfectly at your (or my) literary themed wedding!! They are fancy while also being a teensy bit read it: dangerous. Perfect for your partner! Find these babies here! This simple yet awesome key chain would be perfect for your Shakespeare lover, bonus points if she is also a librarian like yours truly! 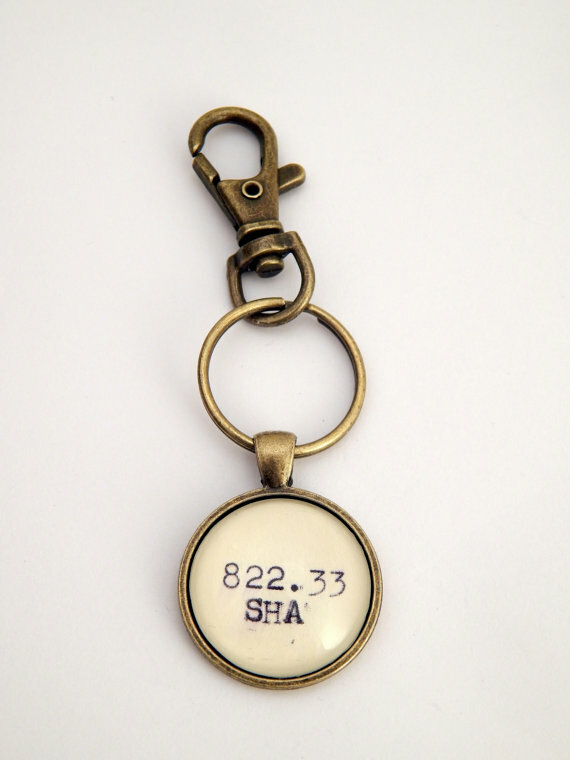 Adorn your keys with this great key chain by heading over here! To Tea or Not To Tea? Is the question….the answer is always a resounding YES!! How lovely would this look hanging in your kitchen? I can picture it now, and it looks gorgeous! Find this tea towel (to buy for ME) here! 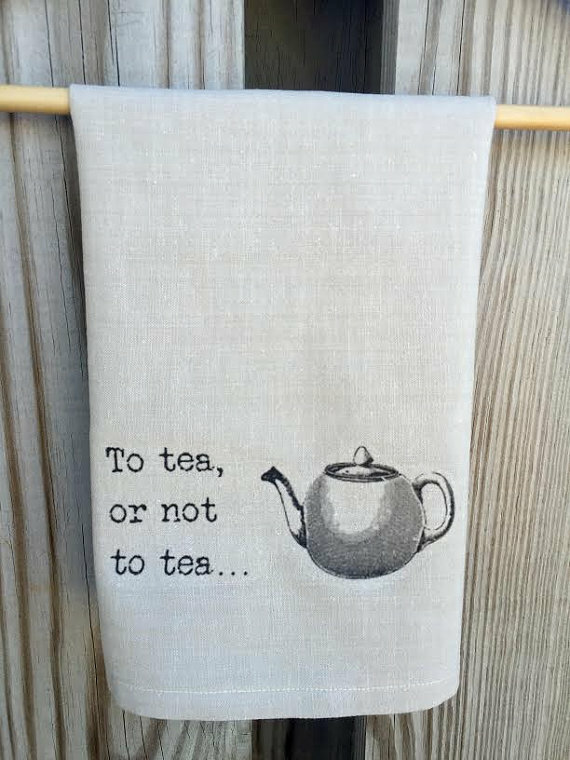 What better pairing to go with your new tea towel than some Shakespearean inspired teas!! Fandom made by Adagio Teas you can get a sampler pack with all different kinds! Speaking from experience, I have the Game of Thrones sampler pack and it is worth. every. penny. Go buy these NOW! I am pretty obsessed with these prints. Though they (apparently) would go great in a nursery, I don’t see why I can’t have them hanging above my own bed! Admittedly, the first quote is from Napoleon but still, they go together perfectly! Find them here!